After I read and loved Twenty Boy Summer by Sarah Ockler earlier this year during my celebration of YA contemporary fiction, I jumped at the chance to read her upcoming The Book of Broken Hearts. After having read two superb books by Ockler, I've come to expect swoon-worthy love interests, and fascinating explorations of relationships, both between friends, and family members. I ended up getting really absorbed in The Book of Broken Hearts, especially the relationships between Jude and her sisters, and although it was an emotional read, it lacked that one extra "something" that would have made it truly excellent. Ockler's characters strike me as memorable because like Anna or Frankie in Twenty Boy Summer, and Jude or Emilio in The Book of Broken Hearts, they're REAL. They're absolutely people you worked with, or went to school with. They have their issues, which I'll get to in a minute, but they're totally understandable. They're characters I feel like I KNOW by the end of Sarah Ockler's books, characters I'm genuinely sad to part ways with. I felt for Jude right away, when I started reading The Book of Broken Hearts. I was just a little kid when my great-grandma Lalah developed Alzheimer's but I do remember what happened to her as the disease progressed. I have some really faint, fuzzy memories of her before she had to go into a nursing home, but the sad part is, the clearest memories I have of her are of us visiting her in the nursing home. In The Book of Broken Hearts, Jude's dad has Alzheimer's, and it was really hopeful and bittersweet, seeing glimpses of him as she remembered him, only to see him struggle to remember where he was, or what was going on. I felt Jude's fear for him really keenly, and thought it was so GOOD of her to take so much time out of her summer to spend it with him. I admired her so much for being able to do that, but I was worried too, about if she and her family could handle her dad's degeneration. That really tugged at my heart majorly, to the point that I was close to tearing up a few times during particularly poignant moments. Speaking of touching moments, I enjoyed seeing what interaction there was between Jude and her sisters. The age difference was sort of odd to me, since there's only four years between me and my brother, but it just made things all the more sweet, with Jude being the baby. It made sense it would be hardest for her to let go of her dad, or think about long-term care options. I loved how well-done the flashbacks were to the sister's interactions with the Vargas brothers. There weren't too many flashbacks, or awkward ones that didn't make sense; instead, I really felt like Ockler utilized them well. Speaking of the Vargas brothers... *sighs* I really liked Emilio. He was an all-around good, awesome guy, and I loved his interactions with Jude. I loved their banter, and how they each got under the other's skin. It was obvious to me as the reader where they were headed, but watching them GET there was the real treat, if sometimes frustrating. I couldn't blame Jude for being wary of falling for Emilio, or him for wanting and needing her to open up to him. I just adored how they challenged each other, and made one another BETTER. Finally, I want to talk about the setting. Sarah Ockler has this way of bring her settings to life, making you feel like you're really THERE. I loved all the cultural information we got about Jude and her family, their language, traditions, and cooking. And I also thought Ockler wove in stories about Jude's dad's past really well, too, and I really GOT it, that sense that Jude's family was complicated, but loving. Those are the families I love to read about. 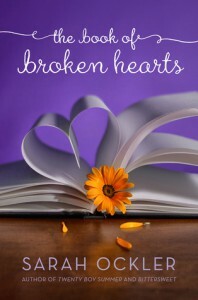 Final thought: The Book of Broken Hearts is an engaging story about love, family, and loyalty. It's the second Sarah Ockler book I've read and enjoyed. Jude is a lovable, if sometimes frustrating main character, and I think readers will love her, and Emilio. With a vivid setting and characters, The Book of Broken Hearts was a truly great read, that only lacked a little "something" to make me have loved it even more.